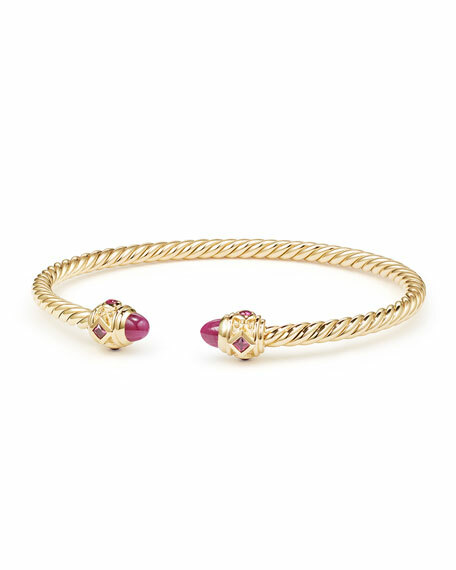 David Yurman bangle from the Renaissance Collection. Polished 18-karat yellow gold CableSpira bracelet. Faceted round red ruby end caps. David Yurman cuff from the DY Crossover?? Collection. Polished sterling silver and 18-karat yellow gold. Alternating cables and buckle-shaped details. David Yurman cuff from the DY Crossover?? Collection. Polished sterling silver and 18-karat yellow gold. Alternating cables and buckle-shaped details. Split opening for slip-on style. Approx. 22mm. Made in USA. Sterling silver and 18-karat yellow bonded gold 10mm wide Lobster clasp *Please Note: This item contains 18-karat yellow bonded gold.